Welcome to Cedar Hill Farmhouse!!! I’m on my back porch enjoying the fresh air, adding some Christmas touches to our house. I wanted to show you more very simple, use what you have on hand, Christmas decor. Here I created Farmhouse Christmas decor using what I already had and just adding cedar from the farm and I bought some fresh hydrangeas. Everything else I had in my house. The greenery, cut from our cedars, is in a old iron pot used to boil hams long ago. The antler cane is one that we inherited. 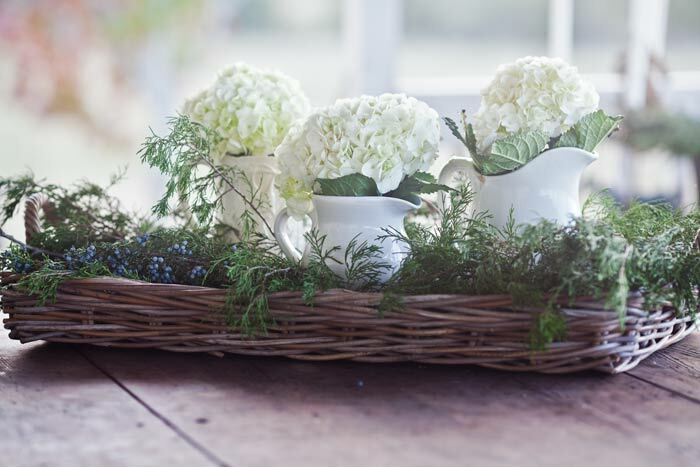 I also used an antique ironstone pitcher to hold the hydrangeas. An old blanket drapes over the back of my French folding chair. An old trunk from the thrift store acts as a table in the background. 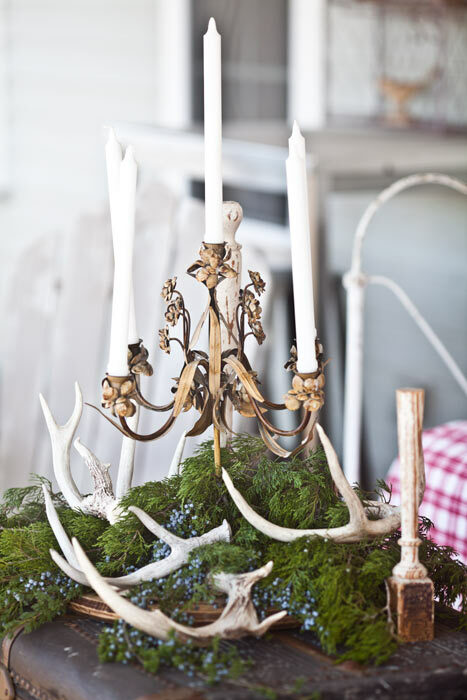 Deer shreds or antlers from our pastures make great seasonal decor. An old enamel pail makes for a great wine cooler. 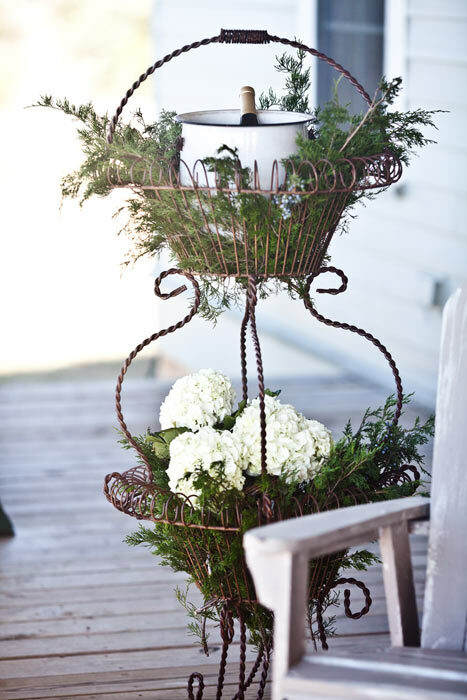 I added the bought hydrangeas to this iron stand to add some softness, but later moved the flowers to my table. I just couldn’t decide where to use them. The cedar is covered in these beautiful berries. One of our favorite things to do this time of year is to make hot chocolate. It’s a Christmas traditional at the farm to enjoy a cup of hot chocolate at the treehouse after dark. We grab our thermos of hot chocolate, some blankets, then around dusk we head down to the creek. Often it’s quite cold (well, for Texas I mean) so the blankets and hot chocolate really warm us up. When we get to the tree house we snuggle up in blankets and enjoy our hot chocolate as we hear the babbling creek below. After trying the flowers in several places, I decided they worked best on my back porch table in my big wicker tray. I used greeenery all over the house, even in my bedroom. Even a red checked tablecloth looks festive and Christmas-y this time of year. I have to be honest, this is the simplest Christmas decor I have had in a long time, and it’s really my favorite. I hope you don’t stress about your decor this year, and that you are able to enjoy your families. I joined several other fabulous bloggers for this tour. You can find them below. Very pretty ! I like your natural look. It looks simply elegant. So very pretty, Anita! Love that steamer trunk on the porch! 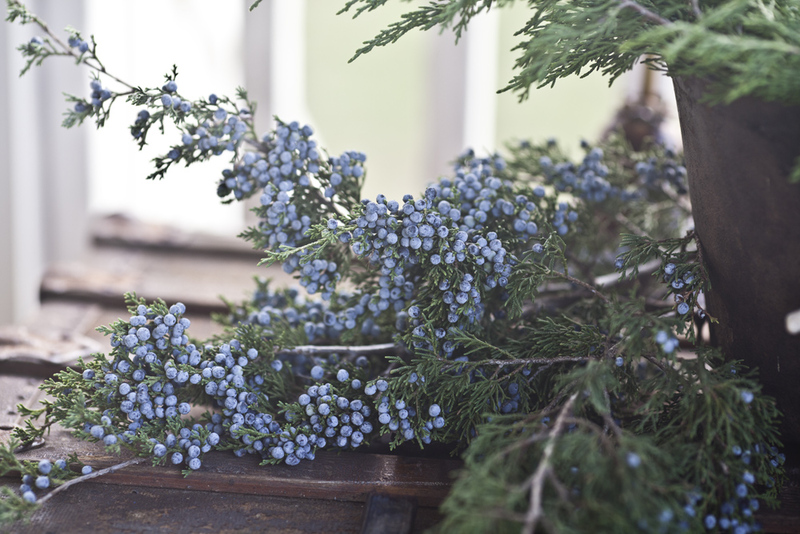 And those cedar branches … wish we had them here! I love simple decor better at Christmas. Every year I scale back a little more, but next year I think I’m going to keep it even more simple! 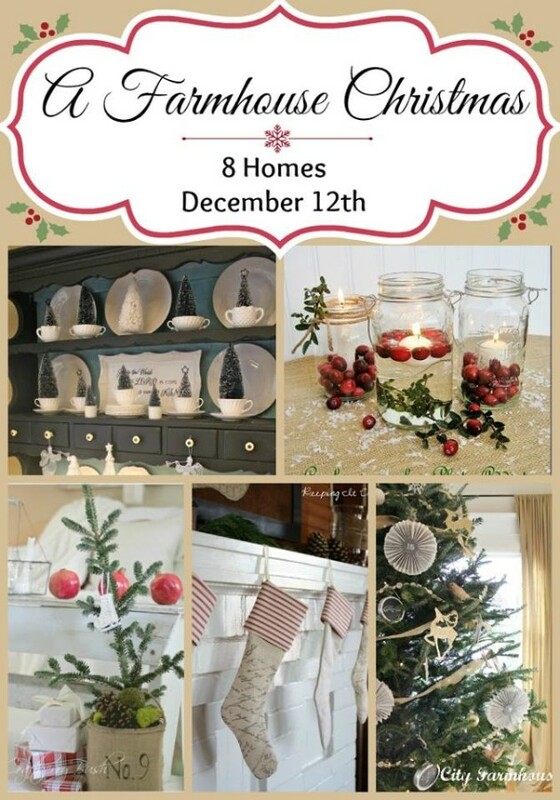 Thanks for sharing your beautiful farmhouse Christmas touches. Very inspiring! Gorgeous, just gorgeous! I love all of it, especially those white candlesticks and the trunk on your porch. Thanks for taking time out of the busy holiday season to share it. What a lovely post and a great little series. I adore farmhouse and am trying to use more touches in my decor. Thank you! Anita, I know I am a day late (and always a dollar short) but thank you, thank you, thank you for including that video yesterday on how to tie a beautiful bow. I draped my greenery down the stairs with a plaid ribbon running through it but I could never do a beautiful bow for the newel post but I can NOW thanks to you. It looks absolutely beautiful and I cannot thank you enough. Merry Christmas! Your porch is so gorgeous, Anita! Your first photo is absolute perfection and I love your fresh greenery! You have such beautiful style. Anita, this is so pretty! 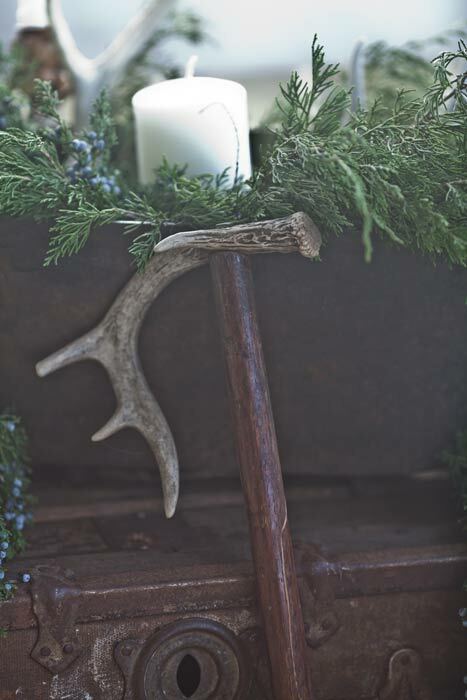 I love the natural elements in your Christmas decor! I would never leave the tree house! 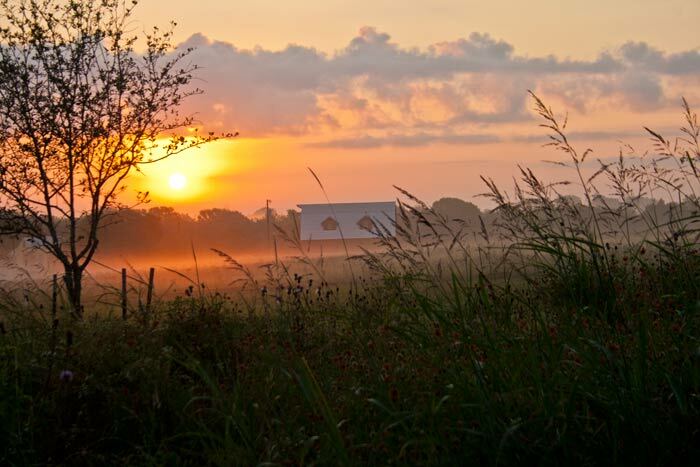 So beautiful – just like everything you do. Farmhouse is YOU! So warm and inviting! Sometimes you can get tired of looking at your Christmas decorations but these you can keep through the winter and enjoy! So much loveliness, Anita! 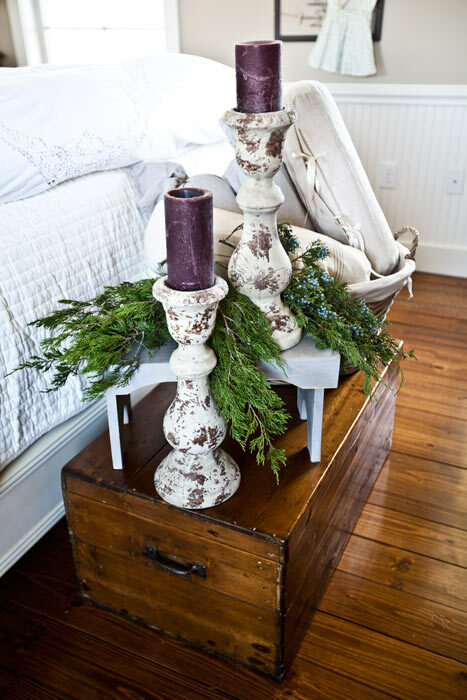 I love your use of greenery to pull everything together for a warm and festive look. Beautiful, Anita! I love your hot chocolate time with family. Sweet traditions and sweet memories are what Christmas is all about. I agree with the simple decorating these days! I have even given some of my stash away for others to use, plenty to go around, lol! I could furnish a B&B with the decor I’ve collected over the years. 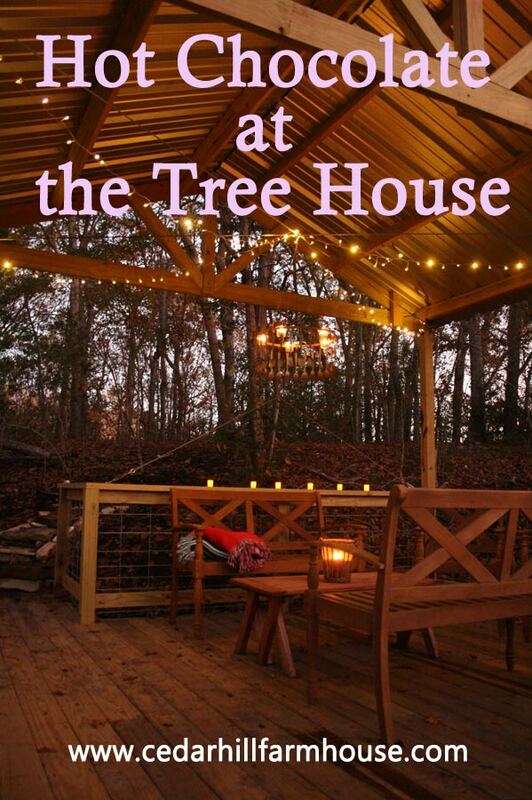 I LOVE your tree house hot chocolate idea, how *sweet*!! I also decorate with antlers, so rustic and naturally beautiful. **Happy Holidays** to you and Yours!! Everything looks so gorgeous Anita! I especially love rustic decor at Christmas time! Anita, your home is so beautiful!!! I just adore that tree house! Happy Holidays to you & your family!!! Anita just gorgeous touches, the porch looks so pretty. 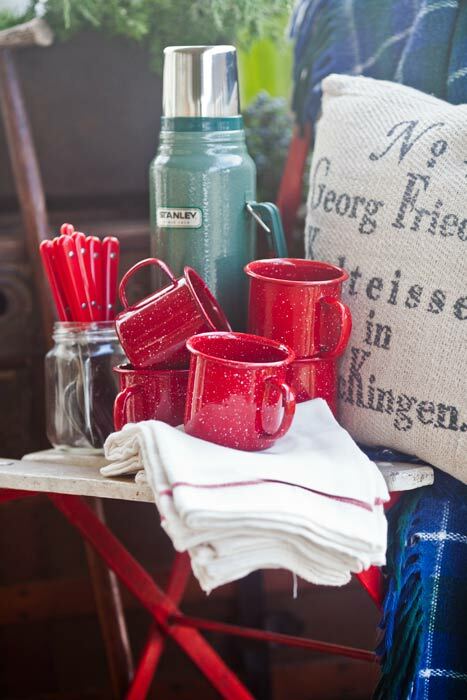 Love the greens and that enamel wine cooler is so clever. Love the stand. I have made two slipcovers for my sofa and have decided to make another one (I had vowed I never would make one again). Your tutorial had a few ideas I had not previously used. Thank you. Anita no wonder it’s your favorite way to decorate… you do it so well. Your porch is GORGEOUS ! I’ll join you in the beautiful tree house for a delicious hot chocolate! All is swoon worthy! 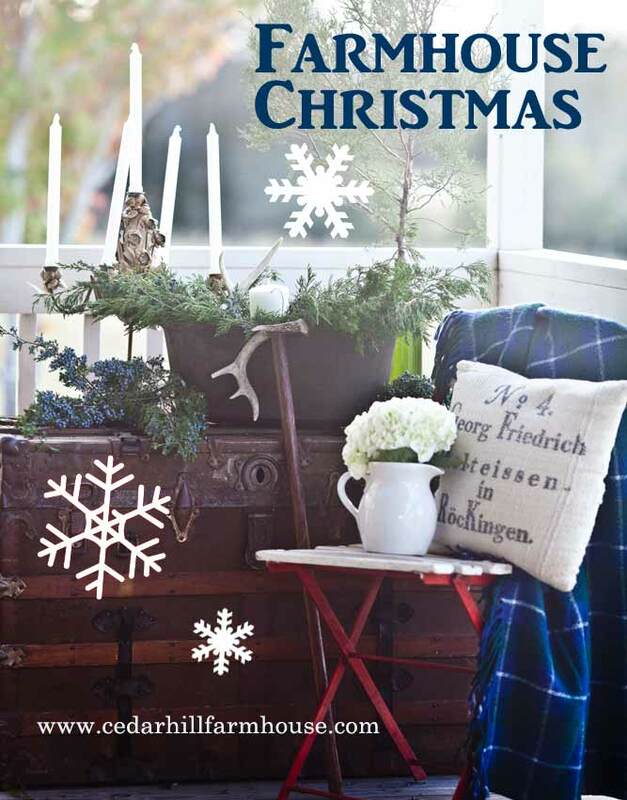 Your home is just incredible in any season and especially at Christmas…just love how you adorn your home with love and Christmas cheer! LOVE decorating with fresh greens. It really says Christmas to me. Everything you do is simply stunning. I kept it simple this year, but I forgot about the bottom branches that were cut off the tree. I think today I will gather them and stick them in some spots that could use a little Christmas cheer. So pretty! Love your porch especially. THe natural elments are wonderfuL! I miss year round proch life up here in PA.
Everything looks really cute! I’ll bet that chamber pot never thought it would see a day as a wine cooler! I like the way you decorated the trunk in your bedroom and of course, I love the antler shed accents. Lovely! I love the simplicity of it all. I love the use of the Cedar boughs throughout your home for Christmas!!! I was swooning over your Family Tradition of Hot Cocoa at the Tree House!!! Darling you know I love your style, and this Christmas decorations, so simply, are stunning to me! 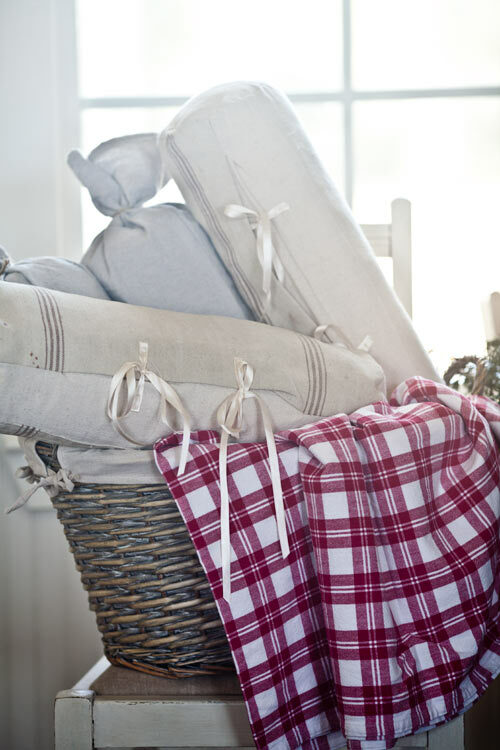 In our home, this year, I decided the same, only simplicity and natural… So cosy! The touch of greenery is wonderful in each of your rooms.